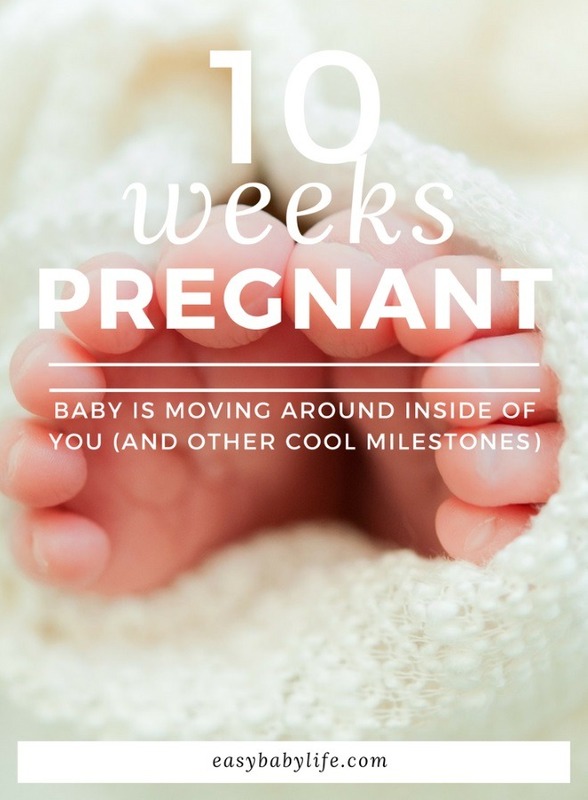 Being 10 Weeks Pregnant - Baby Is Moving Around Inside Of You! Home > Your Pregnancy > Pregnancy Week By Week > 10 Weeks Pregnant – Baby Is Moving Around Inside Of You! 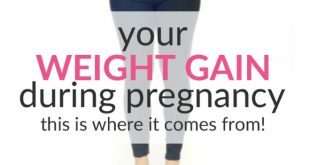 10 Weeks Pregnant – Baby Is Moving Around Inside Of You! When you are 10 weeks pregnant, your baby has started his or her very own exercise program. With arms and legs that can now bend, there are a lot of new abilities to practice. To watch some amazing videos showing fetal development, click here. For mom, this is a good time to start exercising too, especially if nausea and exhaustion are subsiding. You’ll find tips and advice regarding pregnancy yoga here. 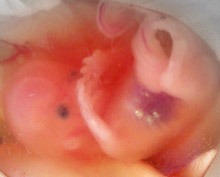 The fetal age of your baby is now 8 weeks. Even though he or she is still tiny, he (she) already looks like a little baby in many ways. And acts like a little baby too! Your uterus has now become an inside playground. The little baby has begun to move inside you, kicking and waving more than you can ever imagine. Although you cannot feel the movements yet, you will in time be able to recognize each time your little one rolls over, kicks or even hiccups. And if you do an ultrasound this week, the heartbeat will be easily seen, as will be the umbilical cord. It can also be possible to see the spine. 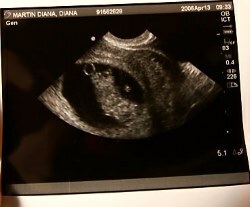 And possibly, you could now even hear the heartbeat of your baby through the ultrasound! Approximately 1.2 inches (3 cm) long from crown to rump, weighing less than a sixth of an ounce (around 4 grams), your baby now has fully functional organs and details are beginning to be more apparent. Swallowing fluid is something your baby is practicing now while swimming around on the inside. Tiny fingernails, fussy hair, and even limbs that can bend at the wrist and ankles help give your little one a more human appearance. The head is approximately half the size of the body overall, bulging slightly at the forehead to account for the developing brain, but rest assured that everything will settle into place as the weeks go by. Your baby can now shake his head – or well, at least move it. If you could see your little one now, the spine is visible along with all the nerves, branching out through the body. Energy levels can be notably higher and you may get some of your appetite back, so don’t be surprised if you start having those weird pregnancy cravings! Linea Nigra is a dark vertical line of pigmentation that may show up on your abdomen, but don’t be alarmed. This is a very common thing and will subside after pregnancy. An old wife’s tale is that a short linea nigra, only to the navel, means a girl and a long means a boy. If you are now less nauseated and tired, consider starting to exercise. An excellent prenatal yoga course is “this class by Jane Austin It is the perfect course to start prenatal yoga. 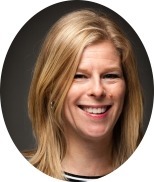 In pregnancy week 10, you are not yet really the target group, but it is not like it is going to be of any harm! If you are still a bit tired and nauseated, but wants to do something for yourself and your body, yoga is a great way! You can read about the benefits of pregnancy yoga and good yoga positions during each trimester here. Constipation is a common discomfort with women during this early time in pregnancy; sometimes it can be due to the prenatal vitamins that you are taking, while others find it is caused by the change in hormones that are slowing up digestion. Remember to go with what you are personally comfortable with. It is your body and your baby and you should do what you feel is right, even now before the birth. Maybe you are still very worried about miscarriage – I know I was! But even so, or at least very soon, reading a pregnancy book is a great way to learn what is going on in your baby and eventually prepare for giving birth. The book What to Expect When You’re Expecting is a great read throughout your pregnancy. 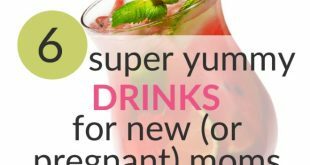 The best-ever selling pregnancy book came out in a new edition in May 2016. 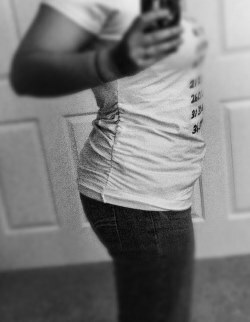 Is your waist expanding? Beachcoco Women’s Maternity Fold Over Comfortable Lounge Pants It might be time for your first maternity pants. These are cheap, soft and work well already in the first and second trimesters. Are you also 10 weeks pregnant? Please share your experiences and thoughts by leaving a comment below!